Why you should/should not water down your hand-soap. Very polarizing. Possibly marriage-ending. People have wildly divergent views about whether or not this leads to more soap use/more water use. For the sake of family unity, best to leave this topic alone. Whether or not cream cheese is frugal and if you can/should make your own. Not sure how we got on this topic, but it ranged for awhile. Should you buy a full set of permanent markers in order to color in scratches on your used furniture? On one hand, you’re looking at a cash outlay for markers, but on the other hand, you’re increasing the longevity of your used home decor. Discuss amongst yourselves. After these circuitous jaunts, aided by a bottle of wine, we rolled around to the concept of entertaining and hosting guests on the cheap. As longtime devotees of entertaining-at-home, my parents agreed to divulge their tips for frugal-taining. 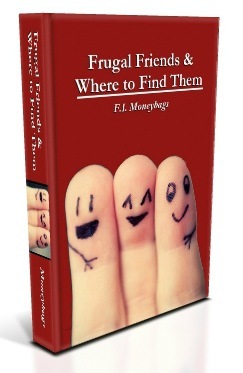 Apropos enough, frugal friendship navigation was an oft-requested topic in my recent Facebook query on what you all would like to read. 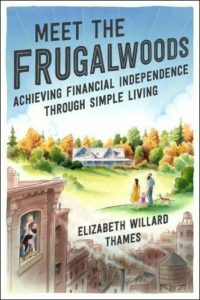 Pursuant to our recent discussion here on Frugalwoods about the liberating power of feeling confident and secure in your frugality is the desire to incorporate frugal tenets into every aspect of life. And socializing is most certainly an aspect of a happy, full life. When Mr. Frugalwoods and I first decided to pursue extreme frugality, we recognized that our stand-by of going out for dinner with friends would need to assume a more budget-friendly iteration. Our solution? Counter invitations out to dinner with invitations over to our house. And every single time, our friends took us up on the offer and were delighted to return the favor. Who wouldn’t enjoy a free homecooked meal? We’ve also discovered that once you start trading at-home hosting, it becomes de rigueur. Now that we’re parents (as are many of our friends), socializing at home is even more preferable for everyone involved. It now yields a quadruple bonus: 1) no one has to hire a babysitter, 2) no one has to wrangle a baby in a restaurant, 3) we don’t have to pay for our meal, 4) flying food is not an issue. As for going out, doing it occasionally is fun; but if it’s constant, it becomes a product of hedonic adaptation, the rarity pleasure is gone and of course, it drains the budget. Restructuring our social life such that most of our friendly interactions take place at home required a bit of tweaking to our thinking. Although going out is the default socialization mode in our culture, there’s no law asserting its primacy. We all fall back on the trope of dinner and drinks out, but it’s entirely possible to create just as festive an atmosphere in one’s abode. See? I made it more festive already by calling it an “abode.” You can use that on your next party invite. You’re welcome. Ok, ok, so now we all understand this pat frugal advice to “entertain at home” and it sounds easy enough; but, if you’re a first-time frugal hostess, it can feel overwhelming to helm a soiree. Fear not, for the combined power of Mama and Papa Frugalwoods along with me and Mr. FW are here to help! 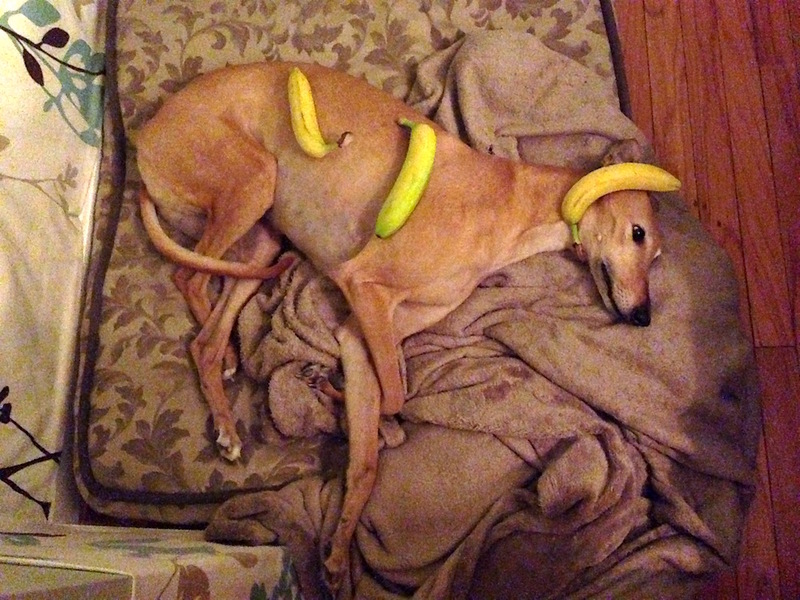 Frugal Hound too (although not really because, honestly, she’s kind of a dog). Food: the cornerstone of any successful gathering. Thus, it behooves us to start in the kitchen for this particular exercise (of course, when doesn’t it behoove us to start in the kitchen?). Cooking from scratch is ‘natch the thriftiest means of victual consumption, but you may not harbor a secret desire to slave away over a stove for 79 hours in preparation for hosting. To alleviate the cooking burden, we make a large batch recipe ahead of time because: 1) we’re not scurrying around the kitchen when our guests arrive; 2) we usually have leftovers to freeze or enjoy later in the week. Focaccia Bread: this stuff is seriously easy to make and looks impressive–I love recipes like that. Furthermore, you can slice up some cheese, toss olives on a plate, and call it a meal. Delicious, simple, yum. Alternately, this bread can serve as an alluring side dish. Homemade hummus with lemon and garam masala. Mr. FW combines the following in our food processor: garbanzo beans, fresh garlic, Chinese chili paste, lemon, garam masala, salt, and olive oil. The theme with all of these recipes is that the base ingredients are inexpensive and then we fancy them up with interesting flavor combos. Still not feeling the cooking vibe? No problem. Invite folks over for a low-impact meal such as afternoon coffee/tea or evening cocktails. Not every at-home shindig is required to be a full banquet. For these off-hour gatherings, I usually bake treats to serve. Frugal protip: triple or quadruple a baking recipe so that you can freeze the extras. Time-saving and tasty! As a general rule, I love King Arthur Flour recipes as they hit that desirable (by me, anyway) mark betwixt super complicated (uh, looking at you Epicurious) and banal (looking at you, AllRecipes). I do use those sites and plenty of others depending on what I’m making, but King Arthur is generally, well, king. 3) Host a cheap wine tasting. 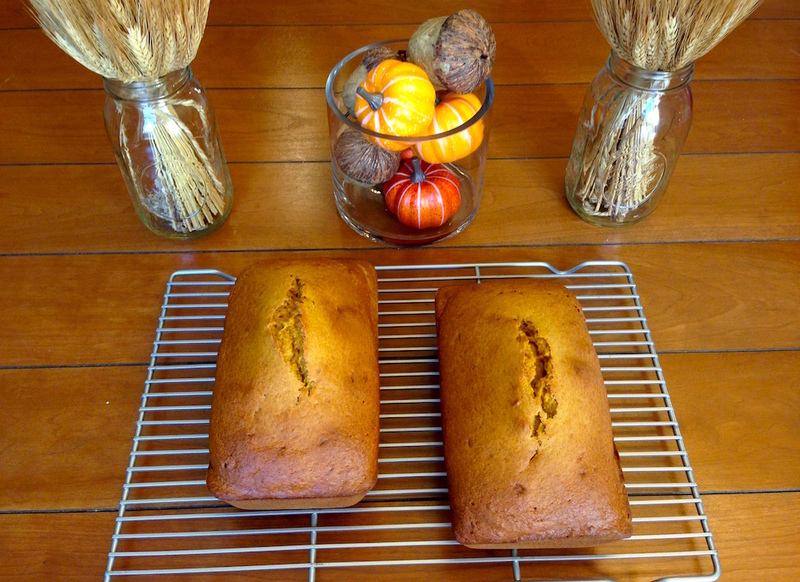 Pumpkin breads: can’t wait for fall!!!! Unlike cheap beer, cheap wine can be rather palatable. I should know, I’ve sampled quite a bit of it. Especially now that I have a kid. Pretty sure most of the white wine sales in this country are supported by parents. Just saying. More to the point, there are so many delectable inexpensive wines available that I love, love, love (super love) the idea of hosting a cheap wine tasting. I haven’t personally done this, but my parents have, and they report it’s hilarious. Recommended cheap wines: anything from Trader Joe’s south of $5/bottle, the Wal-Mart Oak Leaf brand at circa $3/ bottle (do NOT judge until you sample, I am not even kidding, it’s excellent), and of course, the boxed varietals (Black Box, Big House, and Bota Box are my top). Take this as an opportunity to dust off all of your fancy glassware–which, if you’re me, came from either: 1) the side of the road (kudos to Mr. FW for picking up an entire box of stemware while on his way to work one day–of course he then took it into his office and had to explain that he’d found free glassware in the trash for his wife; or 2) when my office cleaned out a storage closet last year and unearthed a ton of wine glasses that no one wanted. No one except, naturally, Mrs. Frugalwoods. Devise pretentious things to say about the wines, pretend that you’re not going to drink each “taste,” deign to be aghast at some flavors, and swish the wine around for a sniff. You know, everything you’d do at an actual wine tasting. Keep notes on the winners and report back here in the comments! 4) Bring back board games. Board games and hors d’oeuvres! Many a fine night we’ve had circling the table with a board game in full force. We used to do frozen pizzas, popcorn, and beer with our friends L and R back when we lived in Washington, DC, accompanied by fierce competition. Our favorites include: Ticket To Ride, Settlers of Cataan, Scrabble, Monopoly (although sometimes that one gets on my nerves on account of its length and also the weirdly worded “chance” cards–why are we forever going to jail?? ), Risk, Pictionary (nearly broke our kitchen cabinet in Cambridge on account of “excessive celebration” with that game), and Taboo. And for the not-at-all-daunted among you, there’s the Frugalwoods family game, played in epic, wide-ranging tournaments by both my and Mr. FW’s families: the card game Canasta. I love theme parties! Especially if costumes are involved! My parents and their friends (who, by the way, are in their 70s) are absolute experts in this department–you need a theme? They’ve got themes. From ’20’s to leprechauns (???) to disco, they have costumes for just about any iteration of theme night. But even minus the costumes, a theme portends great fun. A favorite of mine is “tacky Midwestern food” night. Anyone who has lived in the Midwest will absolutely understand this one. Think: crispy shell beef tacos, cheese dip, corn chips, and brownies. Oh yes, tacky Midwestern food is the best. Per usual, the frugal route is often vastly more creative (and dare I say hilarious) than the typical consumer trope of going to a restaurant. A fabulous way to circumvent the cooking conundrum. I find that there’s no need to assign dishes in advance–somehow, everyone brings something different and it always comes together in a harmonious meld. But What If My Friends Aren’t Frugal? This is, by far, the most common parry against the entertaining-at-home option. And you know what? Your friends don’t have to be frugal in order to support your financial goals, respect your savings-oriented agenda, and enjoy hanging at your house. It’s totally unnecessary (and impossible) to convert everyone over to the frugal side, so don’t try! Fostering a less-expensive entertainment plan doesn’t require frugal evangelization. It only requires creativity and a whimsical embrace of novel experiences. How do you entertain on the cheap? We definitely have friends who enjoy going to each others’ homes rather than going out all the time. We generally do “happy hours” with drinks and light snacks and then if folks want to go out after for dinner, it is there choice. It’s great because sometimes just one couple goes out to dinner and sometimes a few couples do. It definitely gives you the “out” if you want it, but we all get to spend a few hours together first – and we’ve agreed that time is the most important! One other note – we never try to “one up” each other too. No competition is so important to us! Yet another timely post! I’ve been thinking about this a lot lately. My invitations to eat out come from more sources than my friends though. My coworkers eat out at least twice a month for one reason or another, plus I’m dating someone currently and that seems to result in restaurant meals more often than I would like… Invitations from all this sources have broken my monthly budget more than once unfortunately so I’ve had to make some changes. I have a couple of strategies that I’m starting to use. I tend to decline my coworkers invitations but I bring in baking regularly which is something I’ve become known for contributing. It’s fairly frugal to whip up banana cake with caramel frosting, like I did last night, and it’s always appreciated by my coworkers! Plus it keeps me from eating the cake all by myself (not that I’ve ever done that…). I’m getting my SO on board with eating my cooking which is starting to happen more and more. That plus conversation about life goals and other relationship-building discussions help to frame my frugal inclinations. Honestly though, I’m not sure how I could have handled the first couple of month of us dating without all the eating out. Dating is so job-interview-y so being a weirdo is not generally advisable. I’d also like to report that I countered some friends’ invitation to dinner out with dinner at my place and it was totally successful! They commented afterwards that it made for a lovely Wednesday night. I’ll for sure be trying that again in the future! Thanks for the great advice! I feel the same way! I’ve been dating someone for a few months who eats out regularly rather than cooking. I also felt uncomfortable when he always wanted to pay for everything when we went out to eat. So I started inviting him to my house when I felt comfortable with that, and we’ve recently started cooking things together to have for dinner. We’ve had a few conversations about money and our differing perspectives, and it’s sparked some interesting conversation. While it felt a little uncomfortable to bring up, he was very receptive and it’s brought us closer together. Love the board game suggestion, because well… I love board games! 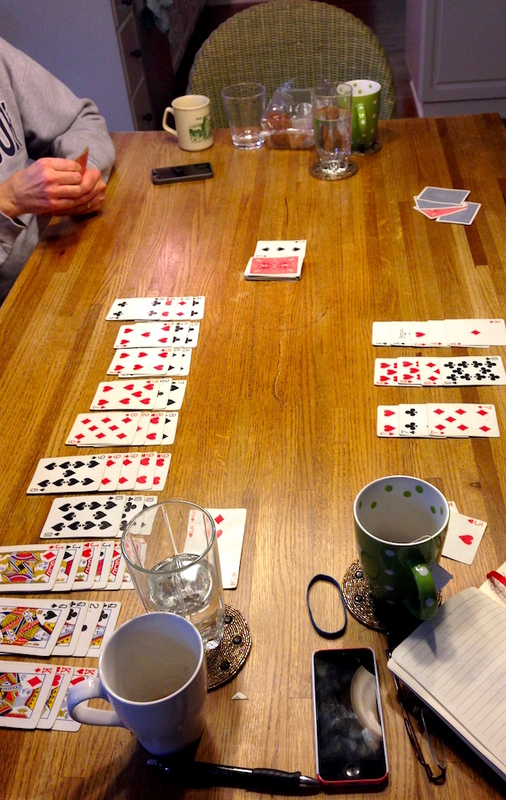 The Canasta photo reminded me that my friends and I have started doing poker nights. A great frugal option. You don’t have to play with real cash, which means it can provide several hours of free entertainment. Don’t fret that your house is not perfect. No one cares. Really, no one cares. If you have time, take a damp microfiber cloth to your bathroom. Takes 45 seconds, looks almost as good as actually cleaning. I mean, I try to keep my house at a certain general level of tidyness, but I used to think that guests required a higher level of cleanliness than my family. How nuts is that? Don’t let fear of being judged for dirt keep you from inviting over guests. That goes doubly for impromptu guests. I’ve been known to invite a friend over on little or no notice because I had enough cheese for more than one sandwich, or a large pot of soup and a new bottle of wine. Who cares if there aren’t three side dishes and you have a visible basket of unfolded laundry? The people that do NOT care are the ones you should be offering soup and sandwiches to. Wow – this one took me forever to get past – “Don’t fret that your house is not perfect. No one cares. Really, no one cares.” It was only after a glass of wine or two (or three) that I could finally lighten up when we entertained. I’m good about it now – but wouldn’t be surprised if others commented about this. One pet peeve (no pun in intended). I do absolutely, positively hate it when pet owners ask me to take my shoes off inside. House is always covered with pet hair etc, dog footprints, and you want me to take my shoes off? No thank you. I’ve started bringing a second pair of shoes with me. Also, you may not have really, really messy friends. Some people’s houses are straight out of “Hoarders.” About that I care. Deeply. And I do not go. And my SO is even worse. Everyone who enters our home, removes their shoes. Everyone! Workman either use booties they bring with them or I provide a pair. When we visit family and friends we immediately remove our shoes. And our three cats have the cleanest paws you have ever seen! We have 5 cats and we tell people to leave their shoes on! I wear hard bottom slippers in the apartment. We can sweep, Roomba, vac, mop — there’s still gonna be cat hair and I cannot stand cat hair on socks. Having my friends over for homemade Chinese food tonight. Cheaper and healthier than going out! Plus we’ll have to throw in some wine “tasting” as well. We take turns hosting dinner parties with my husband’s friends and its great. On the flip side, we have some friends whom we invite to an annual party who always say “we must have you over” and they never do. They have a beautiful home, no kids, lots of cash, and she likes to post her cooking pics on Instagram. But in 10 years we still have not had an invite to their home. It’s really strange. I’d feel rude leaving them off our guest list though. there are many people like this, don’t feel weird, it’s not you! I have actually reached a stage with one particular friend, someone who I have known for a very long time, where I no longer include them in our (very casual, quite-often-potluck, certainly nothing fancy, on-a-budget) get together’s. We have never, in all the years and years and years, not once, been invited to their home for anything other than their toddler’s birthday a couple of times. Never. It’s rude and it’s not reciprocal and in the end, it wears a friendship down. I get totally that not all of us are wild entertainers. But never? Not once? ”Oh we must do xyz” is useless without a follow-through, and after a while, gets a bit insulting. Stick with the people who do reciprocate from time to time, in some way. I have, and it’s really culled my guest list! We are fond of pot luck picnics! Bonus points for a small cooking fire. More bonus points for a snowshoeing/cross country skiing pot luck picnic with bonfire! In those cases I might suggest you hosting a potluck. That way you’re not always the one spending the beans to buy food and drink when you’re hosting at home. That’s a tough one. Over the last 10 years (since kids) our socializing has changed to be more frugal. That means that in your case, we only see our friends in times when we host. Years ago, we’d have our neighbors over for dinner because the kids were playing and it just segued. Now, it’s less likely to happen (kids are older, and we’ve added kids – so they’ve got 3 and we’ve got 2, so that’s 9 people). I recognize that my friend feels easily overwhelmed at the idea of hosting (to be honest, so do I). – Going out with visitors. Because they like it. – Mom’s nights, or mom group lunches. My mom group does mom’s nights out for dinner/drinks/ movies. I go to these, maybe 2 a year. They also like to get together for lunch with the kids. Usually it’s while I’m working, but once a month it’s on the weekend. So, I got about 3-4 times a year, not every month AND I usually eat before I go. It’s a casual/ outdoor/ picnic table place. So nobody notices if you eat or not because you are chasing your kids. I usually would get my kid a kid’s meal and eat whatever he doesn’t. – Work lunches with old friends. 4 times a year. – Sunday potlucks with the neighborhood. So, some friends who like to eat out a lot…they go to the potluck about 1/2 the time. We now see them there, and not out anymore. So, while I don’t *never* eat out, I want to make it count. I’d say we eat out on average 2x a month. Some people just don’t want to host, so I work around them. If I really want to see them, I find a way to make it happen, and cheaply. Excellent post. Your discussion of wine reminds me od wise advice I read many years ago and internalized: The best wine I’ve ever had? Whatever I am drinking right now. I vote for applesauce oatmeal bread any time! Love, love, love that stuff! Bring and braai: each person/family/household brings their own meat, and a salad or dessert,and own drinks. Hosts usually provide a hot dish (‘pap’ and sauce). Meat is cooked over an open fire, and the meal is enjoyed outdoors. Go on, admit it… you wish you had South African friends. Oh I really do! That sounds fabulous! Not a pap fan though. I’ve tried, but… no. You threw a wonderful party! And your son is an amazing chef! Babywoods and I very much appreciated the floor space and breastfeeding-friendly environment ;). Happy to host the next meeting–let’s chat about date! Have you read/perused Amy Sedaris’s “I Like You”, her hosptiality/cooking book? You can find it used on Amazon for $4 including shipping if you’re so inclined and can’t find a copy at the library or from a friend. Anyways, she’s the queen of home entertainment in my opinion and I recommend scoping it out if you get a chance. She’s big on theme parties too and crafting everything yourself! I also learned from her the trick of adding an extra teaspoon of vanilla to desserts. One more teaspoon doesn’t hurt (especially if you get vanilla in bulk at BJs/Costco) and it adds a lot more flavor. She does have a silly sense of humor–I don’t know if you watched Strangers With Candy, a show that got her a cult following. I own that book :)! And YES to the vanilla. I also find that adding almond does the same! I am shocked at the recent spike in vanilla prices. Fortunately, I make my own, so no big deal. Yes, an extra teaspoon of vanilla is de rigueur in my kitchen. DH gets one in his oatmeal every morning, so we go through a lot. Recently we helped someone downsize. A bottle of rum was one of the spoils of the experience. We don’t drink much, so I turned it into vanilla. Yum! No contest! I’d go to Carmen and Tim’s for the best frugal party. Even having to fly there would make it worthwhile! Carmen would have a costume (whoever went to Carmen’s and didn’t dress up as something). Tim would have his stories to tell and you don’t even have to laugh politely cause they are funny. Then, they’re just plain NICE. The best part of going to any party is being with great people. Whoa! I can’t believe my eyes. Did you just call brownies tacky? Thanks for the frugaltaining ideas. I host book club at our house too, and they’ll come in handy. It’s so much easier to have a discussion at home than in a noisy, crowded restaurant where lingering isn’t encouraged. We have a wine club. Everyone brings a bottle of that night’s style. We taste and compare them, using words like “oaky” or “grape-y.” Maybe some people bring some food also. I always make something or pull something I made earlier out of the freezer. I’m very much against ordering food for a group of people, because I would rather see the variety of a potluck and get to experience everyone’s cooking instead of something from a restaurant. When people invite us out, we’ve declined enough times that people get the message. Either they start doing things at home, or they go out and just don’t invite us! We’re having our annual Labor Day party tomorrow (a week early) and to make it a frugal affair, it’s a themed potluck. This year’s food theme theme is Taco Bar. 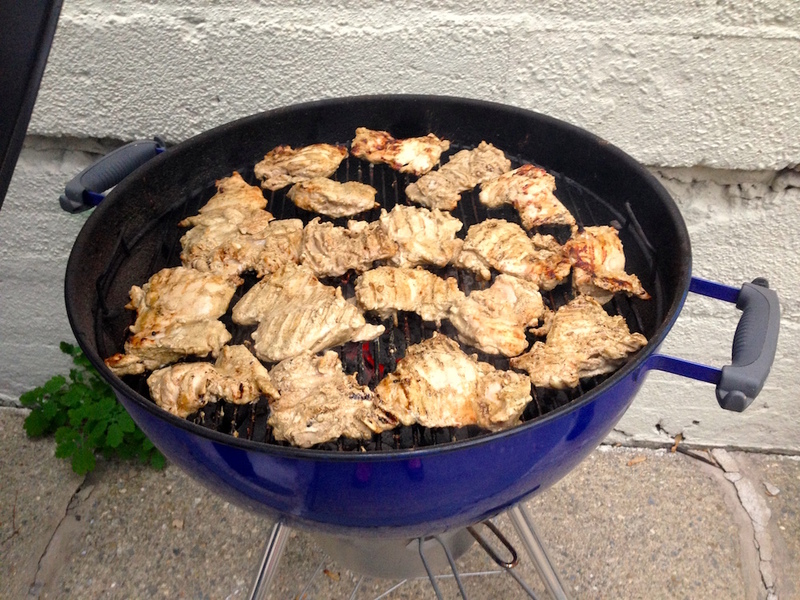 Cheap and not necessarily meat focused, as many summer parties are (hot dog and hamburger cookouts are the norm in my extended family, but other food themes are healthier and cheaper! ). We’re providing beef, beans and tortillas and asking guests to bring fixings. Rather than purchase chairs and canopies that we only need once a year, we borrow these things – the canopy is my dad’s and I borrow the chairs from work. My husband just built a bench out of wood scraps for more seating, and it doubles as a planter for flowers! We’re borrowing lawn games too, as that also tends to be an infrequently used item. All in all I think we’ll pull this fairly large party off for well under $100! Watered down hand soap is the best! We use Dr. Bronner’s and a foaming dispenser. My fiance and I get together with friends and family in our home at least once a month to play canasta with cocktails, so I LOVED seeing that you two partake in our beloved cutthroat parlor game as well! I give six thumbs up for Wal-mart’s Oak Leaf Moscoto, $2.98 a bottle. I drink more of it than I care to admit…. Better than beer because I don’t have to return the bottle for a deposit! These are wonderful tips, and timely too as I am getting ready to host a girls evening get together. I always feel like I could be hosting in a more cost-effective way, and this post will come in handy. I thought my family was literally the only family that played Canasta! Wow! Growing up, families in my neighborhood rotated hosting “Friday night parties” in the summer. The hosting family provided food and drinks for the kids, and each family brought an appetizer and libations for the adults to share. It was a blast for both the kids and the adults. What a great post! It is usually so much more fun to have a home themed party than to have 20 people at a restaurant. It’s usually noisy, the bathrooms are far away, someone always gets something that they don’t like, and the tip is going to be a killer. My favorite group game is Triominos. We add a second set if we have more than 6 people. A friend sent this to me: “Being independently wealthy is a whole lot better than being dependently poor.” It covers so much territory in desires-versus debt! This blog has helped me start digging out of my dark hole. Having stuff is NOT wealth! 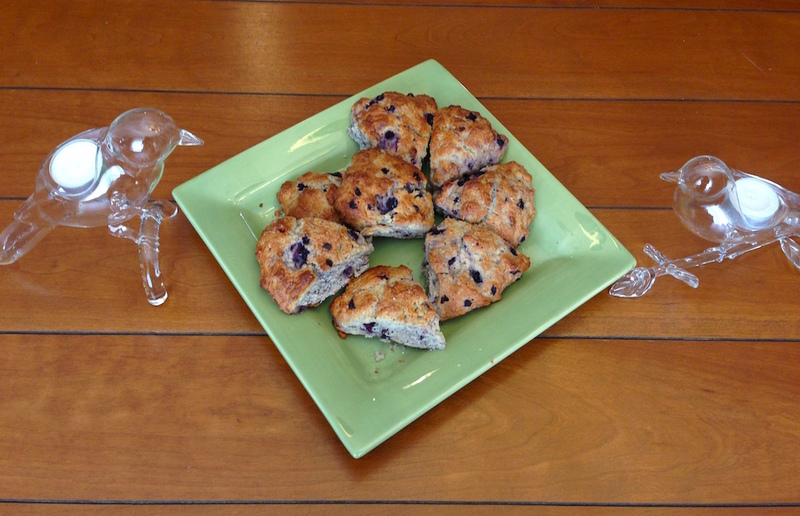 Try the vanilla scones on the King Arthur website. My dogs are insane for them-and everyone else likes them too!! I love entertaining from my home! Especially at home girls nights! Painting nails, popcorn, and chick flicks are amazing! Oh my word. 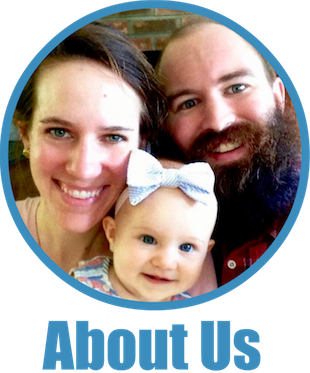 Have you heard of family cloth? I’m not frugal enough to go there. On another note, we have been enjoying a new game – Ticket To Ride. You may want to check it out. In Wintertime, we get together with two other couples. Each couple brings a crockpot of their favorite soup. I provide a home baked bread and a dessert.. It works out good for everyone they take home their leftover soup and have a ready made meal for the next night..
Lots of great hosting ideas Frugal Woods. One doesn’t need to be a big spender to be social! We’re big fans of snacky food and board games…a perfect combination of socializing success! Oh, and about the hand soap. Foamy soap dispensers FTW. Just mix the gel type hand soap with a little water (so it can pass through the foam dispenser) and you have instant foamy soap at dirt cheap prices. It spreads easier than gel hand soap, and won’t just run off like watered down hand soap does. It’s cheap *and* better! Something salty, something sweet, cheese, olives, crackers and a pot of coffee. Book club read-aloud of an old classic. Great evening. We recently found some good friends that live up the street and we all get along well plus have kiddos the same age. It’s been great going back and forth with them in hosting each other for dinners and play dates. These are all great suggestions, but honestly, what about us serious introverts? I just really don’t like to have people in my space. (Man, that makes me sound weird.) We do host family gatherings, and have had friends over a few times, but it’s just not my thing. I’d rather meet a friend for coffee one-on-one than have a bunch of people over. It’s OK to be introverted, and in the vein of this website, can lend itself to frugality! There was a Frugalwoods post in the past that talked about “you do you and I’ll do me”. It was to do with being frugal vs more spendy, but I think the idea could apply to loving parties or not too. I’m introverted too and when I see people it’s because I love them, or want to celebrate something with them. I want to see people, and make people feel cared for, but have to gear up and balance with quieter time too. I have a little group of recipe, baking and cooking loving friends and we do theme potlucks. We’ve done country themes like: Germany, France, Ireland, UK, India, Spain, Italy; regional themes like Africa, North America, Tex Mex, Mediterranean; and idea themes like: a favorite, your choice, comfort foods (that one resulted in a lot of pie pastry dishes), fall harvest, appetizers and next we are trying home takes on fast food. (I realize this works best for the recipe-reading enthusiast.) Sometimes, someone might meet a new interested person to invite or the family in the host house eats too, but more contained than a big party. Getting together for coffee, one on one, or in a little group, or having meal get-togethers, rather than big parties are great too. You do you. Great post*. One suggestion when you entertain frugal friends @ your home. Have a decorated basket on a table by the front door for guests to deposit their cell phones. They can retrieve them when they leave. Logical exceptions of course:. Doctors on call & a call from babysitters. This could really get to be a fun, regular activity. Also…if you live in a city apartment, or small condo/townhouse, having visitors is hard. Especially small visitors. Any suggestions for us cramped city dwellers? Good question! Back when we lived in a tiny 1-bedroom basement apartment, we still hosted people all the time. For parties, we’d often end up with folks sitting on the floor or on our bed. I’d set up a card table in our living room with food on it and everyone had a great time! It was cramped, but our guests didn’t mind. The babies who came to those parties were usually corralled by their parents into one area or another and played on the floor–I learned not to light candles on low surfaces! Hmmmm – I look at things a little differently. We love to throw a full-on feast. Of course we cook it all ourselves from scratch and have a fabulous evening with fairy lights, chiminea burning etc etc. We usually cater for 20. This then allows us to open up the topic of frugality with our guests and get an unscripted conversation organically flowing AFTER the main course has been consumed (think delicious french hot pot dishes, roasted fowl, hot apple cider with cinnamon…(aaaah). So, over dessert the topic is frugality (dessert is home made profiteroles with home made creme patisserie for example). Guests are without exception astounded at how cheaply a full-on feast can be achieved and they always say what a wonderful earthy and delicious evening they have had. Most come back with gusto when invited again. I guess what I am saying is that we save our pennies so we can do the things in life we really love. Connecting with intelligent interesting folk around deeply delicious home-baked food with an open fire and balmy evenings is very high on our list of meaning things to do in our life. Totally do not disagree with anything that has been posted here – just thought I would share this different approach with you all. Great ideas here about how to welcome spends friends into the frugal fold, so to speak. Game nights are tons of fun and usually lead to at least one raging fit of the giggles. One of the games we really like is called Balderdash. It’s based on the real definition of really odd words. The dealer deals, announces the word in play (along with spelling) and judges the definitions submitted by the players along with the original card with the real definition. It’s hilarious and usually disintegrates quickly with the types of definitions being turned in. On a slightly different note regarding lunch with coworkers, one must be very careful in how they walk this one. Especially at higher levels of management and/or in the worlds of professional services, part of the job is developing relationships with potential clients (external business development by meeting and connecting with current and potential clients, typically over lunch or happy hour), building relationships with those in senior leadership you may hope to one day replace (head of your practice group or division, either joining her or him for a client lunch or attending a learning presentation to improve your skills), and learning about other groups within your same firm or company (internal business development), etc. Many times the tab for these lunches will be picked up by the senior person at the table, but you’d better go prepared to pay just in case. One final thought: I had significant recruiting responsibility for my former employer for interns, new hires out of school, and lateral mid-career moves. Each and every time a candidate came in for an interview, they’d already been screened, put through 1 or possibly 2 phone interviews, before being flown in for in-person interviews and lunch. Before lunch, we can see interactions with reception and administrative staff, and lunch is when I observe your interactions with the hostesses and wait staff, how you handle an incorrect order and solve a problem, the answers to questions posed to you at a table in a more relaxed environment. And then, if we give you an offer and come work for us for 8 weeks, I want to learn everything I can about you so I can determine whether you sincerely enjoy the work, whether you are teachable, whether our personalities mesh, whether you do have the academic/work background you put on your resume, and most importantly, I need to know whether I can work with you on a transaction 14-16 hours a day for three weeks solid without wanting to punch you in the face, Or, if after working with you on a time-sensitive matter that has to be completed before my vacation date, the date I told you no less than 15 times, and whether I’d be comfortable putting you in front of my client. You can learn a lot of things about a person in that 1 hour lunch than you can all week. I guess I’m just recommending that avoiding work lunches wholesale in the name of frugality may not be the best use of your time and money resources. When bonus evaluation time is on hand, understand that all other factors being equal, the friendlier person whom you know better I’d bet gets a higher raise than the person who declined every lunch out or coffee run to hide in his or her cube to eat a sandwich and chips. One alternative I spearheaded back then was a once a week impromptu pick nick. Everyone would order in or grab their lunch sack, we’d spread out our food like a picnic in an open area of our office building or at the local nearby park. That worked great. Understand the impetus to save as much money as possible, but when it comes to soap you should not add water to the dispenser and let it sit for weeks or months. The reason is that the soap is formulated to resist bacteria/fungus/etc. growth, but when it is watered down it can make a more hospitable environment for nasties to grow. Yes tap water is not sterile, and yes some microbes can proliferate in liquid soap (even the antibacterial kind) especially when diluted with water. What is the point of using soap to wash your hands etc., if you are using bacteria filled soap to do it? Therefore, non-antibacterial soap must be rife with bacteria and germs. I think not. We’re doing our own “beer fest”…everyone bring 3 bottles of the “fancy beer” and we’ll all do tasters…we’ll provide the cheap beer for after we’ve all had a couple heavier beers. Along with your wine snob on cheap wine theme which we totally do, the funniest thing we saw lately that just cracks me up, is you know about the sniffing of the wine and twirling it around watching it crawl up/down the glass walls and slurping it….new to wine aficionados: twirl it next to your ear to listen for the ring…can’t you just hear the flavors? simply awesome to see some peoples reactions. Oh please please PLEASE could you post your Chana Masala recipe? I love your rice and beans make it frequently. You totally should water down your soap! Those foaming hand soap dispensers can be refilled with about 10% soap and the rest water, shaken, and pressed back into service. AND you get that awesome foamy soap that’s easy for little children to rinse off. I’ve been using the same $4 liquid hand soap refill jug for a year and it’s still almost completely full. I predict my soap costs at under fifty cents a year. Not going to make you rich overnight, but it’s easy enough to do. Thanks for the post, I binged and read them all over the past couple of months. About the soap…I used to work for a large multination company that happens to make a lot of soap and basically ALL liquid soap is majority water. You are paying a lot of money for water and the plastic bottle or even the refill flexible pouch. If you want to be practical – let alone frugal – buy bars of soap in bulk and recycle the paperboard cartons. It takes another couple of seconds to lather the bar with water, but works just fine. And no, the germ load is not a big deal for everyone skeeved out… just rinse the bar and put on a little draining dish. Over ‘antibacterial’ use is actually more harmful than not, unless you have a severe immunodeficiency. For the TP, most important feature (since pretty much all TP is septic safe) after whatever ‘comfort’ level you like is that it be made of 100% recycled material. Yes, trees are renewable, but do we really need to be using virgin wood fiber to wipe? Another fun potluck idea is all tapas/apps – most folks like variety and to pick at foods… it’s also good for folks with space constraints because you can put various platters and bowls all around on various surfaces and folks can migrate around talking and eating. 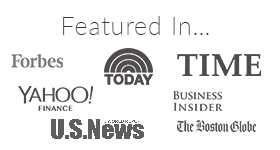 Thanks again – I look forward to your postings. We’re hosting a get-together activity at home, and we’re planning to encourage them to potluck and have a theme to categorize the food each group is bringing. I think this is a great strategy to limit the expenses. Another great game is Qwirkle – it’s like a tile version of the card game Sets, if you know that one. It would be a great addition to your collection. I love Taboo. Another good card game is Five Crowns – similar to gin rummy but fun for a wide range of ages. Thanks for the Apple Oatmeal cake recipe. Sounds very tasty. Fantastic tips! I haven’t hosted a lot of gatherings at my house and have always wondered how to entertain on the cheap. I especially like board game night cause they’re high fun and low cost! On the soap-watering-down topic: If you water down the soap you are also watering down the preservative in the soap, leaving it susceptible to all sorts of gross things that grow in that excess water. Perhaps I am biased, but I started my chemical engineering career making janitorial supplies (including hand soap) and we would test and hold different formulas (including experimenting with less preservatives) in search of the cheapest for certain clients and there was definitely a threshold at which things got horrifying. Solid soap can be preservative free, but once you add water, you need to watch out. I love getting all my nice pieces out, although don’t do it as often as I’d like. I also think it’s worth thinking about frugal friending when you live further away. Too far for a simple potluck dinner on Wednesday, not far enough that they have travelled specially to stay with you. Some nice things to do then are to meet at a museum, park etc and then bring food. Couple of times we’ve been to Trafalgar Square and sat by the fountain with croissants, strawberries and cava with disposable cutlery and glasses. Ok, the disposable stuff not so frugal but means you can then go round museum, see a play etc without carrying dirty crocks. With all your apples you could make apple cider (up here in canada we call it cider when its alcoholic). We have lots of apples and press juice in an old style press and then make cider ala mr moneymustache http://www.mrmoneymustache.com/2014/04/22/brew-your-own-cider/. In 2-3 weeks fizzy yummy cider. Works great. we bottled/secondary fermented in plastic bottles ( dasani type water bottles and plastic cider bottles work great. Not all bottles work because others puff up and you lose fizz) though to avoid explosion risk. This year we also made it with plum juice made using a steam juicer. Also yummy but plum juice reacts a lot so less yeast needed. It also keeps in fridge for months if by the wierd chance you dont drink it all right away. We love entertaining at home. I like organizing a ‘main’ – pulled pork in the crock pot or something like that and then asking people to bring salads/chips…things that are easy to pick up or make at home but not hot things so people don’t have to travel with crockpots. As I get older, the more I find I like staying in or just going over to someones house instead for a potluck, movie or just to hang out. I am part of a TTT (Terrible Tuesday Theatre) where a group of friends and I get together at each others houses for dinner and bad movies. Everyone takes turns hosting and all brings stuff to make a meal with. It’s great to see friends and frugal at the same time. You know, Mr. Picky Pincher and I just had the “watered down soap” debate this weekend! I’m staunchly a soap-water-downer, because most commercial soaps are already concentrated out the wazoo. And funnily enough, I’ve been making my own cream cheese for a few months! All I do is make a batch of homemade yogurt and strain it for about 12 hours. It makes a substance called “yogurt cheese,” which is a perfect cream cheese replacement. I absolutely love these hosting ideas! I would also suggest digging up group video games to play, like Mario. For our food hosting needs, I always make some type of bread (along with other stuff, too, of course!). Last time it was biscuits with jam and butter. Not only is it tasty, but it’s pretty filling! Tried the applesauce oatmeal bread this weekend! 3 of us almost finished a whole loaf in one night…good thing I doubled and froze the other one! It was delicious. Yes! Hosting dinner is awesome. Our family is from New Orleans, so we host New Orleans-style dinners, and they’re always a hit. Gumbo, jambalaya (both of which are cheap to make), or a crawfish boil (not cheap, since we now live in DC, and we refuse to get crawfish outside of Louisiana). A non-NOLA favorite is roast chicken, which is surprisingly easy. Somewhat random question… You mentioned Chinese chili paste here, and I saw it in the rice and beans recipe too. I couldn’t find any at Costco and my grocery store only had a tiny bottle for like $4… Is there a particular brand you guys use for that? Do you have an asian food store in your area? It’ll be cheaper there. My friends and I will alternate having each other over for dinner once a month or so, and we all enjoy board game nights too. My favorite get togethers are around the holidays though. A week or so before Halloween, we’ll have a few people over for dinner and pumpkin carving. You can make it BYO pumpkin, but aldi around here has wonderfully inexpensive pumpkins that are a great size for carving, so we’ll often buy a few extra. Before Christmas, we’ll have people over for dinner and cutout cookie decorating. This is my absolute favorite, and it’s always entertaining seeing people’s artistic skills (or lack thereof) when decorating cookies. We do an easy crockpot meal (have done meatballs to make meatball subs) to allow for lots of time to prepare cookies. Send some cookies home with everyone, as you’ll have way too many anyway. Other examples include dying easter eggs or having people over to play in the snow (we don’t get snow often here, so we try to enjoy it when we do) followed by hot chocolate and soup or chili. We have just started out with the frugal lifestyle and in past 6 months I have learnt what a big drain on wallet going out with friends can be. I love hosting but for some reason people are more comfortable going out. I am wondering if a BYOB party would be better since most of the people here can’t really host at their place. Do you find that hosting a bunch of friends ends up costing as much as if you went out and just paid for your own meals? If your friends reciprocate, it would end up being much cheaper in the end, but in my experience, others aren’t great at that. This is my problem. I just go out with them and eat a bowl of soup at the restaurant. I would spend at least $50 cooking for them. Every fall I host a “Soup Fest”. Each family brings either a pot of home-made soup (gotta love a row of crock-pots bubbling with soup) or some bread to share. I make a ton of pumpkin and zucchini muffins and fill Ziplocs with tinted, home-made cream cheese frosting so the kids can decorate their own treats. We make fun crafts such as using used tissue paper and mod podge to turn jars from the recycle bin into holiday lanterns for porches or window sills. We just eat and play all day and everyone heads home with a craft, some treats, and usually a container of soup for later in the week. When my family gets together, we typically do potluck theme – salad bar, taco night, etc where everyone brings an ingredient or two and we end up having a variety of things. Much easier than having one family responsible for everything. We also have “make your own dinner night” where everyone brings an ingredient or two, we make it together and then bake/cook it together. Always lots of fun and cheap! Where did you get your beautiful (and presumably frugal) dinnerware? I would say that this kind of hosting has benefits far beyond frugality and the ‘convenience’ factor for parents. I think our DNA is much more suited to this type of gathering… picture the tribe around the campfire. It is hard to socialize at a restaurant with more than 4 people. Plus, you can’t get up from your seat often and you are limited to how long you can stay and linger. I much prefer going to someone’s house. I’m all for chipping in and bringing food and drink to avoid restaurants. Plus, you can control some of the ‘menu’ options by bringing your own. Hosting a get-together at your home is a great way to save some extra money, especially when you have good company to share it with! 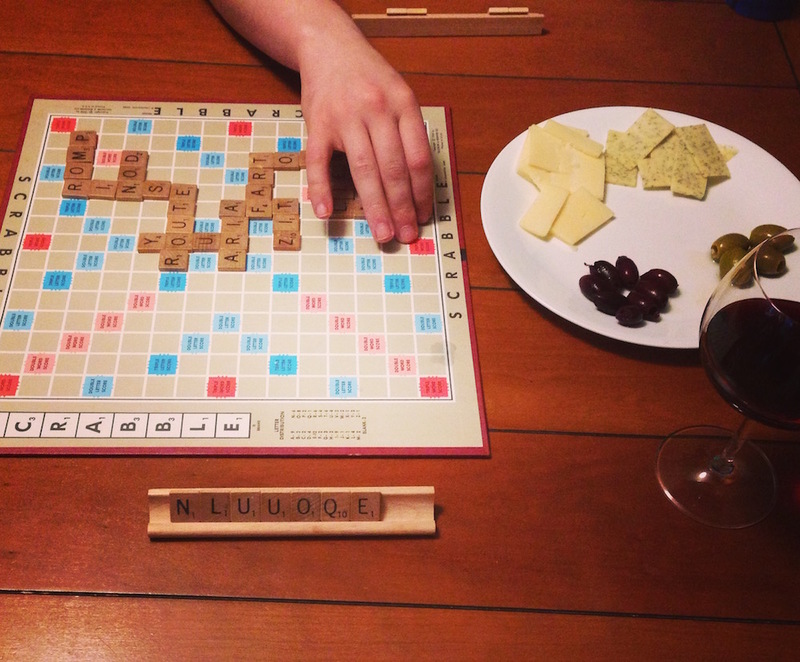 Board games and cheap wine sounds like an ideal night to me! Monopoly is one of my favorite board games to play, but make sure you have enough time because you will need quite a few hours to finish it! Watering down soap – I got tired of finding a layer of liquid soap that family members just sloughed off into the sink, so I refill foamer dispensers with watered down soap. The Method ones are great, last for a long time after their initial fill runs out, and they’ve got a large base so that they don’t tip easily. Works great, and less is wasted. Don’t bother buying expensive foamers. Also, you can use up shampoo or similar products that someone in the house bought but then decided they didn’t really like. If you’re mixing one bottle at a time, they won’t sit around for too long, thus the warnings about bacteria growing in them are less of an issue. One caution – there are soaps/detergents with different chemistries, and sometimes if you mix them, you can get a really gloppy, not very pretty, mess. But they will still work as soap. Confine these messes to the bathroom or laundry room that visitors don’t see. Bar soap always seemed to be either sitting in a slimy puddle, or draining into a slimy puddle. I’ve seen in the past a jar with a pump on it, and glass or plastic largish beads in the bottom, for using up bar soap slivers. I’ve thought about doing this with whole bars. There are also magnetic holders for soap, where you press a piece that looks like a bottle cap into the bar, and it is suspended over the sink. Those can make a drippy spot underneath, but might suit you. So I do have a question about this one- I love having friends over to my house for hosting and entertaining. However, I rarely find it is cheaper than going out for drinks somewhere. For example, if I have 6 people over (usually more), I need to buy probably at least two bottles of wine, about $20, and a few snacks, the least would be popcorn and chips, but still can be another $10. So for the cheapest of hosting, we’re already at $30. And usually, I am not the cheapest hostess, so in reality I’m looking more at closer to $40 to $50. Even if I ask all my friends to bring drinks and a snack, somehow costs still creep in. This is in comparison to going out for drink at a bar with live music ($5 cover) and ordering 3 drinks over the course of 3 hours ($8/drink), I’m looking at being set-back about $30-$35. What do you Frugalers do to help keep these innate costs of hosting down while still providing enough for everybody to be entertained? What key point am I missing? Thanks! Potlucks! We do lots of potlucks with our friends. Everyone brings a dish and/or a drink to share and hence spends only as much as they would on their own meal. We’re in our early 70’s and have 2 couples we play card games with. We buy an Enjoy coupon book from our local hospital ( a fundraiser for them) and when it’s our turn to host, we pick a restaurant from the book and get one meal free. More often than not, we take home enough food for another meal. We have one restaurant whose sangria we love, but usually just get water. No dessert as the hostess does that. We are all financially secure, but a lifetime of frugality sticks ! My book group takes turns hosting each month and we go out for dinner once a year for the holidays. The host provides the main course and the rest of the group brings appetizers, bread, side dishes, non-alcoholic drinks, and dessert. It’s great, we get to try so many different things and have a great time! We hosted a Leftovers Friendsgiving for our frugal friends this past year and it was awesome. Literally, bring your leftovers! No pressure to make something that wows! It was clearly just about spending time together. Then I got to use the leftovers of the leftovers (cranberry sauce muffins!) after the party. Tacky Midwestern would definitely need tuna fish hotdish and a jello salad featuring minimarshmallows or cottage cheese. How funny this post just turned up in my inbox and coincides with our winter party we are hosting tomorrow night (we live in Australia). We’re trying some frugal party throwing and invited 17 adults and 13 children to our house. We’re making mulled wine in the slow cooker (yes, you can use quite cheap stuff and it’s still awesome! ), having a good old Australian sausage sizzle on the bbq and a marshmallow roast over a fire pit in the backyard. I asked everyone to please bring a plate (Australian pot luck). Everyone’s thrilled to attend. I’m giggling over the hand soap discussion. I tried making homemade soap (castille + a tiny dab of dish soap + water + essential oils in a reused foaming dispenser), which worked just fine for me but my husband HATED it. He humored me for about six months before he finally asked me to please for the love of god buy normal soap. I relented and found a good one on Subscribe and Save that’s cheaper than I can find in our local stores. I’ll just have to find another thing to cheapskate around our house!